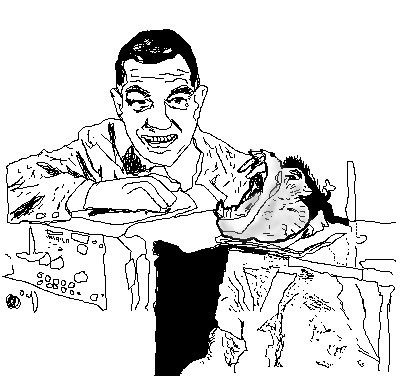 Josef Mengele, the Angel of Death, is the most notorious of all the Nazi scientists who used human prisoners in their experiments. He is particularly remembered for his research on twins, most of whom were children. He experimented on dwarfs and people with abnormal physical characteristics in general. He studied noma—“a gangrenous condition of the face and mouth…known to result from extreme debilitation,” and eye color. 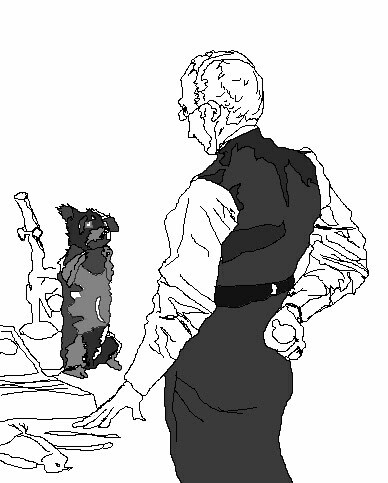 In all these areas, he was particularly desirous of determining genetic factors. Genetics was a watchword used at the time by the Nazi’s to justify their infamous goal of racial purity. 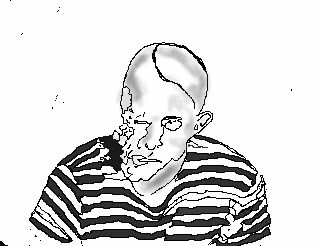 Few if any people today voice a scientific appreciation for Mengele’s research (unlike the praise for J. Marion Simms’) or any of the other research using human prisoners conducted by the plethora of German scientists who did so. But if Germany won the war, history would have painted them in a much different light. 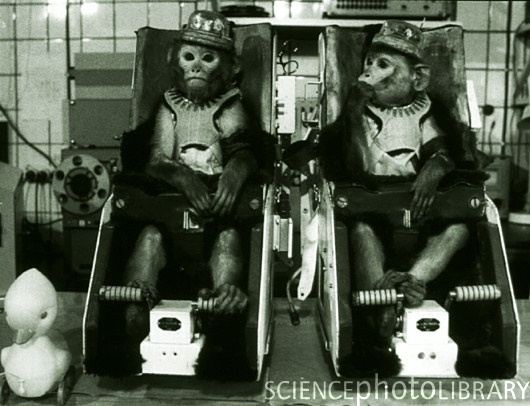 Today, there are a plethora of scientists around the world who use monkeys in their experiments because they believe them to be very like us; not only in a mechanical sense – all primates have a four-chambered heart, for instance – but also mentally and emotionally. Some of them use young monkeys because they believe them to be substantively like human children, mentally and emotionally. Nearly all scientists who use animals in publicly funded behavioral research and in neurophysiological research on the brain do so because they believe that animals’ brains and behaviors are so similar to our brains and behavior. This is evident and stated clearly in many scientific papers. 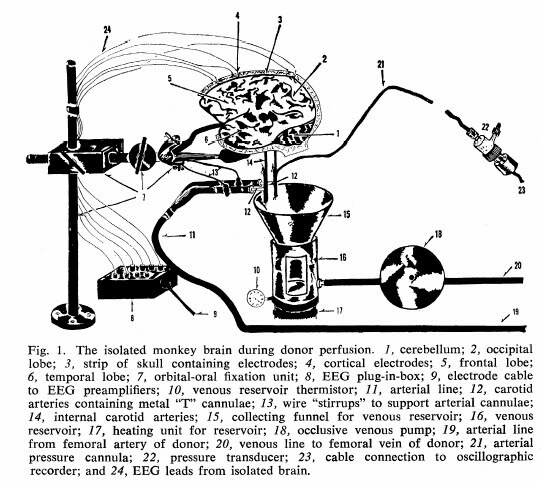 Not surprisingly, this is particularly true in experiments on monkeys. 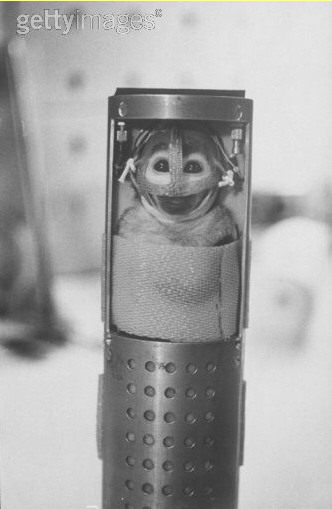 This belief – that a human child and a monkey child are so much alike – is what fueled Harry Harlow’s, Steven Suomi’s and Harlow’s many other students’ personal career choices. Stanley Milgram’s work suggests strongly that permission and encouragement by authority accounts for the limits many of us place on our actions. This comports neatly with Lawrence Kohlberg’s stages of moral development. Kohlberg said that morality for most of us is just a matter of doing things that others reward us for doing, or obeying people and institutions we deem to be authorities. If someone like Stephen Suomi had been a Nazi scientist or a doctor in the antebellum south, is it very far-fetched to imagine that he would have been isolating human children in vertical chambers? It is likely that scientists who today use animals because the animals’ emotional responses to the world are very like our own, are members of the same set of personality type that includes Descartes, Magendie, Bernard, Seligman, Harlow, Simms, and Mengele. It’s hard to know how many people with this personality type – monsters – are active today, but there are at least many thousands. Limiting the group to just those who are using monkeys in publicly funded experiments, or further still, to just those using young monkeys in publicly funded psychological or brain physiology experiments whittles the number down even more. And with the Internet, it’s a matter of only a few keystrokes to gather a rough list. 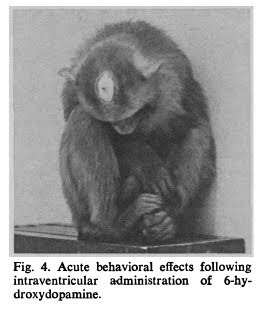 Infant abuse in monkeys shares several similarities with child abuse in humans, including its prevalence in the population, the relation between age and vulnerability to abuse, some psychological characteristics of abusive mothers, and the role of psychosocial stress in triggering abuse. In rhesus and pigtail macaques, infant abuse is concentrated in some matrilines and among closely related individuals such as mothers and daughters or sisters. The abusive mothers who served as study subjects had been observed in previous years and their abusive behavior had been documented. Only mothers whose frequency and severity of abuse did not jeopardize their infant’s life were used for this study. These abusive mothers were typically consistent in the frequency and severity with which they abused offspring born in successive years. … the focal sampling method focused on hourly rates of maternal abuse as well as hourly rates of the following maternal behaviors: making contact, breaking contact, cradling, grooming, restraining, and rejecting. Infant abuse was operationally defined as dragging (the mother drags her infant by its tail or leg while walking or running); crushing (the mother pushes her infant on the ground with both hands); throwing (the mother throws her infant a short distance with one hand while standing or walking); hitting (the mother violently slaps her infant with one hand or arm); biting (common definition); stepping or sitting on (the mother steps on her infant with one foot or both feet, or sits on her infant). The results of this study demonstrate that rhesus macaque mothers who abuse their offspring produce daughters who are likely to become abusive mothers themselves.… In addition, previous studies have shown that macaque mothers who abuse their firstborn offspring continue to exhibit similar patterns of abuse with all of their successive offspring, [He cites three papers to substantiate this claim, all co-authored by him in 1997 and 1998.] thus suggesting that maternal inexperience is not a primary cause of abuse. By at least 1997 or 1998, Maestripieri thought that monkeys who abused their offspring (by dragging, crushing, throwing, hitting, biting, and stepping or sitting on them) would continue to abuse their subsequent children. 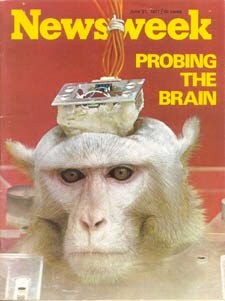 In 2005, he was still watching and writing about mother monkeys abusing their babies, and continues to do so. 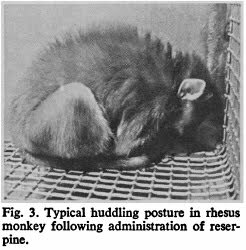 Given the almost absolute control over the monkeys’ lives that Maestripieri and the Yerkes staff have, we must conclude that the infant abuse that occurs there is not the mother monkeys’ fault. It is the fault of monsters that, knowing full-well what will happen, allow successive generations of abusing mothers to keep having children who will themselves go on to be abusive. Let’s take a fast tour around the country. Tarsorrhaphy is the medical term for sewing the eyelids almost shut. 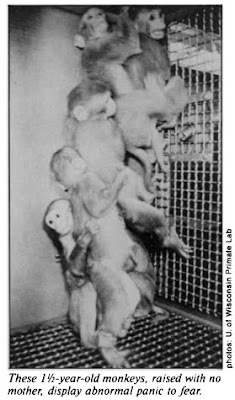 At the Washington National Primate Research Center at the University of Washington in Seattle, Gene Sackett, one of Harlow’s students, reports that monkeys placed at birth in a torture apparatus are severely impaired months later. Now we know. 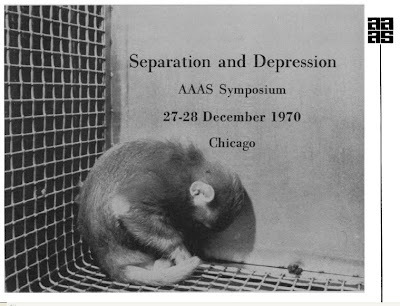 This image shows that Sackett et al are wrong about their cruelty being the first of its type, and the sort of thing that the Washington monsters have been doing to the baby monkeys. It’s quite evil. At the University of California, San Francisco, monsters are severing the largest of the muscles that control eye movement. 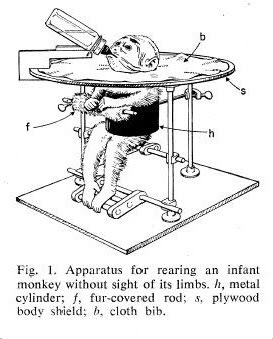 (7) They are doing this to newborn infant monkeys. Then, when they are between three and four years old, they attach a titanium post to their skull. Then they restrain their heads and record their eye movements. 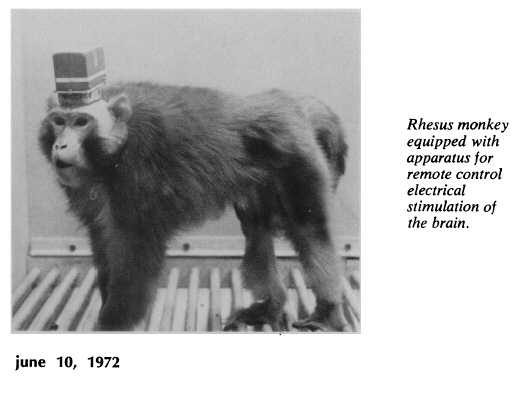 Although they are unsure whether they used two or three monkeys in this experiment, they are certain that the monkeys’ damaged eyes were able to track less well than their undamaged eyes. Monsters at University of Wisconsin’s Harry Harlow Laboratory of Primate Psychology continue to churn out an endless string of papers detailing the effects of exposing pregnant monkeys to alcohol. This paper, “Early predictors of self-biting in socially-housed rhesus macaques (Macaca mulatta),” was published in 2007. Suomi has been observing and reporting on the devastating effects of maternal deprivation since 1970; he’s still at it almost 40 years later. The present non-human primate findings are discussed in terms of their relevance for autism. It looks like he’s simply being paid to demonstrate a known fact. What’s urgent is that monsters like Nijland and McDonald stop and desist. Who doesn’t know that pregnant mothers, pregnant mice, sheep, monkeys, and humans need an optimal diet to deliver as healthy and robust a child as possible? Do we need to know the arcane biochemistry of isolated organs affected by sub-par nutrition? Only a monster could dream up such meaningless cruelties and them scheme to have taxpayers foot the bill. We could keep going, but the facts are clear. 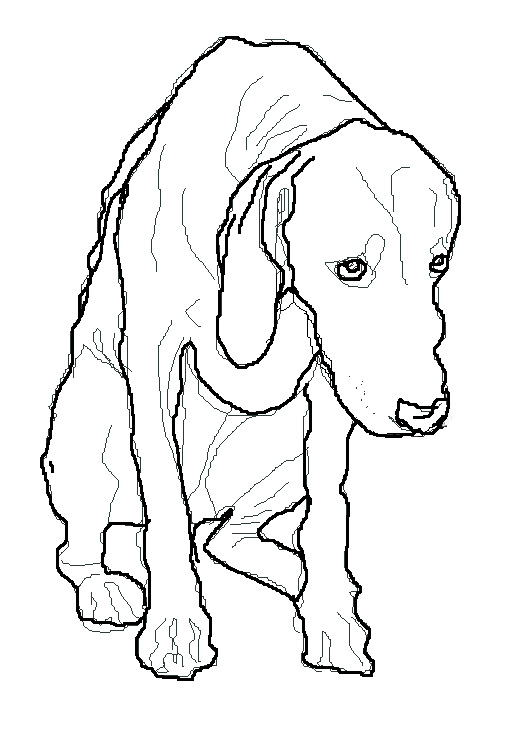 All over the U.S. animals are in the clutches of very callous and cold vivisectors, who like their monstrous predecessor, Claude Bernard, cannot hear the animals’ cries. (1) Robert Jay Lifton. The Nazi Doctors: Medical Killing and the Psychology of Genocide. New York: Basic Books, 1986. (3) Dario Maestripieri. 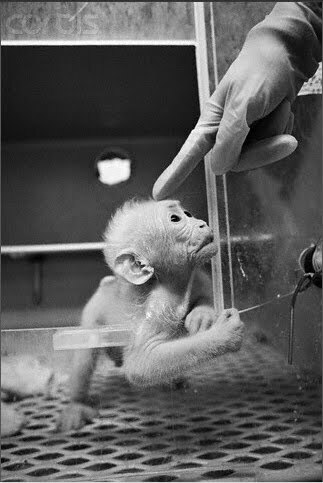 Early experience affects the intergenerational transmission of infant abuse in rhesus monkeys. Proc Natl Acad Sci U S A. 2005. (4) Georgiana Cheng, Henry J. Kaminski, Bendi Gong, Lan Zhou, Denise Hatala, Scott J. Howell, Xiaohua Zhou, Michael J. Mustari. Monocular visual deprivation in Macaque monkeys: A profile in the gene expression of lateral geniculate nucleus by laser capture microdissection. Molecular Vision. 2008. (5) Batterson VG, Rose SA, Yonas A, Grant KS, Sackett GP. The effect of experience on the development of tactual-visual transfer in pigtailed macaque monkeys. Developmental Psychobiology. 2008. (7) Economides JR, Adams DL, Jocson CM, Horton JC. Ocular motor behavior in macaques with surgical exotropia. Journal of Neurophysiology. 2007. (8) Kraemer GW, Moore CF, Newman TK, Barr CS, Schneider ML. Moderate level fetal alcohol exposure and serotonin transporter gene promoter polymorphism affect neonatal temperament and limbic-hypothalamic-pituitary-adrenal axis regulation in monkeys. Biological Psychiatry. 2008. (9) Lutz CK, Davis EB, Ruggiero AM, Suomi SJ. 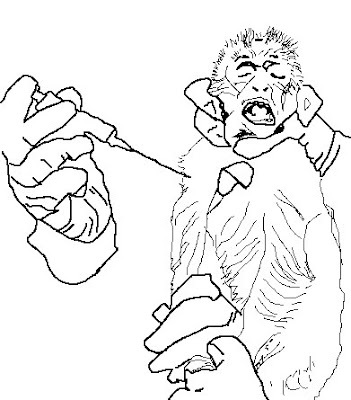 Early predictors of self-biting in socially-housed rhesus macaques (Macaca mulatta). American Journal of Primatology. 2007. (10) Goursaud AP, Bachevalier J. Social attachment in juvenile monkeys with neonatal lesion of the hippocampus, amygdala and orbital frontal cortex. Behavioural Brain Research. 2007. Throughout history, but increasingly since the late 17th century, a small number of people have been restraining living, awake, resisting subjects and dissecting them, or otherwise causing them unremitting intense pain and fear. 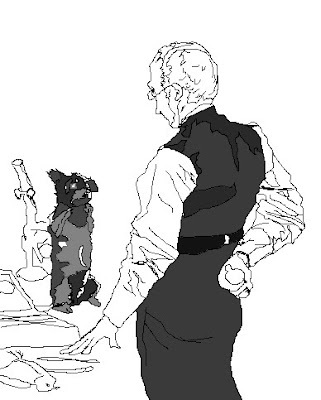 In the 1800s skilled vivisectors invented ways to keep animals alive throughout many hours of demonstrations and investigations, cutting into, cutting out, destroying, and otherwise mutilating ever more critical tissues and organs. Even after ether was introduced as an anesthesia in 1846, these monsters continued to inflict horrific suffering. 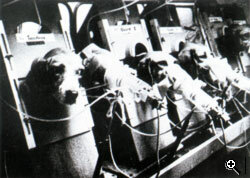 The early history of modern vivisection and the accompanying antivivisection effort has been researched and written about by a number of scholars; my purpose here is not to retell this dark and profoundly evil chronicle, but to note that the modern attitude regarding animals in research is rooted in this period and that today, the scientists spoken of and alluded to in this series of essays, are direct academic heirs to and adherents of the values established then. Few of them, of course, can today imagine themselves dissecting living screaming animals, but humans are notorious for their false beliefs about themselves. Today, few people will say that they would have taken part in the Nazi persecutions, yet many people did. Given permission, and certainly when ordered to do so, the large majority of us will willingly do many evil things. But there seems to be a distinct and important difference between the large majority of us who do what we are told, and the small minority of us who choose on our own to do things that we know will cause great suffering. The first group are humans: error prone and gullible, but who naturally adhere to the Golden Rule; the second group are monsters. An important part of this ancestry is various governments’ protection. People who did really gruesome things simply because they claimed that what they learned by doing them added to our knowledge or might be put to good use some day by medical doctors were more or less given free reign to harm animals any way that they liked. In the United States, this attitude was extended to African slaves; experimental surgeries were performed on them without anesthesia, for instance. 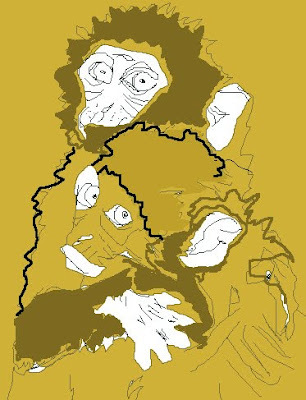 While human rights efforts eventually and severely curtailed (but have not ended) the use of orphans, blacks, prisoners, the mentally retarded, and other politically weak groups in harmful experiments, no similar gains were made for animals, and only cursory progress has been achieved even now. Today’s monsters stand squarely on the shoulders of their predecessors. René Descartes (1596-1650), with his claim that animals do not feel pain, gave permission and encouragement to all who had been bothered by their similarity to us. 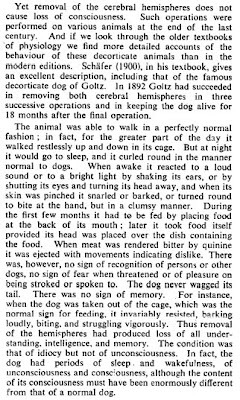 According to Descartes, only humans have immortal souls, and thus, only humans have consciousness; animals are machines only and can experience neither pain nor pleasure. Descartes’ authoritative influence might be hard to overstate. He has been called the Father of Modern Philosophy, the Father of Analytical Geometry, and has had a profound influence on subsequent thinkers. 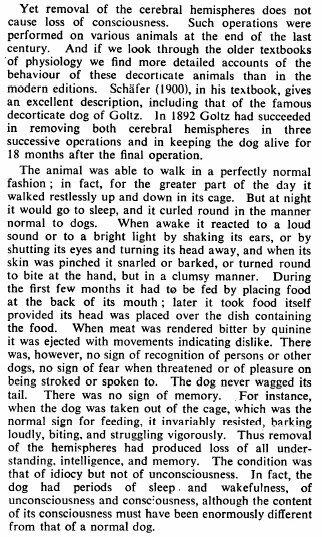 But even at that time, there were those who themselves were cutting into live animals yet questioned Descartes claims about animals not feeling pain. Those who believed that animals do have feelings and suffer under the knife are of a different kind altogether from someone who might be coaxed into physiological examinations of living struggling animals if they genuinely believe that the struggles are not indications of pain, a mind, and fear. Among those who readily acknowledged animals’ pain, yet ignored it, were highly influential scientists whose persona was so strong as to establish a moral right to inflict great suffering. 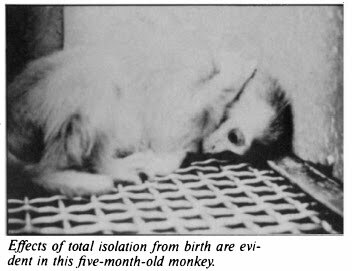 As we will see in the essay on Harry Harlow, this is a common character trait that has and continues to partially account for the enduring acceptance and support of vivisection by various facets of society. These “experiments” included dissections of the horses’ eyes, the viscera, and even the removal of the hooves. And all of this was done without benefit of anesthesia of any sort whatsoever. It seems more than clear that the majority of us would never do such things to an animal or another human being, but it is undeniable that a few of us not only would, but do so with fervor and gusto. This behavior is so far outside the norm that it cannot be thought of as a normal human behavior. The only way to explain such behavior is to admit that there are monsters among us who do not hesitate to inflict misery and who find a certain joy in doing so. place. Even so, because the laws are weak, violations are common. (5) In the absence of oversight, conditions are bleak and cruel because the natural propensities of the vivisectors and the industry that supports them can operate true to their nature. (1) Claude Bernard. An Introduction to the Study of Experimental Medicine. (1865) Translated by Henry Copely Greene, A.M. New York: Dover, 1957. (2) An eye-witness account by Nicholas Fontaine (1665-1709) in Richard D. Ryder. Animal Revolution, Changing Attitudes to Speciesism. Oxford: Berg, 2000. (3) From E.S. Turner. All Heaven in a Rage. New York: St.Martin’s Press. In Norm Phelps. The Longest Struggle: Animal Advocacy from Pythagoras to Peta. New York: Lantern Books, 2007. 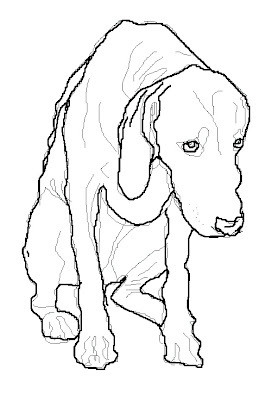 (4) Animal Welfare Act as Amended (7 USC, 2131-2156). (6)(A)(i).